The spine is simply another word for the vertebral column, and is an abbreviation of spinal column. It constitutes, therefore, a bony column made up of vertebra one on top of another, joined by fibrous intervertebral discs. 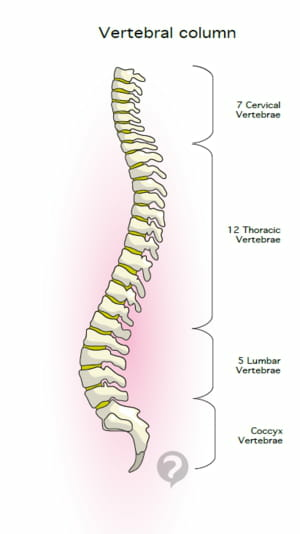 The thoracic vertebra make up the longest section of the spine with twelve vertebra altogether, progressing from the base of the neck to the middle of the back. The upper section extends from the cervical vertebra and the lower meets the lumbar vertebra. Its name "thoracic" is because of the twelve ribs making up the thorax that are joined, fixed or movable, to the twelve thoracic vertebra. The thoracic vertebra are concavely curved, towards the back of the body, which is called kyphosis. Apart from their mechanic role in supporting the body, these thoracic vertebra ensure the protection of the spinal cord and every nerve emerging from the vertebra that principally innervate the different areas of the thorax. Original article published by Jean-François Pillou. Translated by Jean-François Pillou. Latest update on August 19, 2014 at 12:37 PM by christelle.b. This document, titled "Thoracic vertebra - Definition," is available under the Creative Commons license. Any copy, reuse, or modification of the content should be sufficiently credited to CCM Health (health.ccm.net).